Did you know that Hugo Boss has a new scent for women? Boss Fragrance's Nuit Pour Femme is their sophisticated and fresh new scent! I just love it!!! The sleek black bottle design is reflective of BOSS's inspiration for Nuit Pour Femme: The Little Black Dress! Don't let the strong and somewhat masculine look of the bottle dissuade you, this scent is totally feminine and light! I almost did a double-take when I saw the bottle thinking "Wait, is this a Men's Scent?" (Side note: I review both Men's and Women's fragrances on this blog. So, I often get sent Men's fragrances for review). However, as soon as I sniffed it, there was no question that this perfume is all-woman! Boss intended this perfume to be the perfect compliment to the Little Black Dress: the uplifting finishing touch giving you confident reassurance! I mean, who doesn't feel great in a LBD with a killer fragrance? This BOSS Woman Nuit Pour Femme fragrance is feminine while being strong and sensual. BOSS was inspired by women who are organized, driven, and ambitious while also seeking balance and fulfillment in life. BOSS's new celebrity spokeswoman, Gwyneth Paltrow really does embody BOSS's vision for the Nuit Pour Femme fragrance. Honestly, this scent is exactly what you would "imagine" that Gwyneth smells like! Boss's Nuit Pour Femme is such a refreshing scent to wear! Not only is this scent great for evenings in your LBD, but also Nuit Pour Femme is extremely wearable for everyday, too! It is absolutely perfect for the hot Spring and Summer months!!! The scent is just so...clean! Here is what Gwyneth said about BOSS's new scent, "I was honored and very happy to be chosen as the face of BOSS nuit Pour Femme. To me, the BOSS woman is driven, ambitious, and goes after what she wants, but she balances being strong and feminine at the same time-characteristics that I strive towards in my own life." Top Notes: The juiciness of white peach combined with the thrilling radiance of the wet aldehydic accord provides a fresh and sparkling effect. Heart Accord: Beneath the modern top, the heart accord represents...feminine sophistication, featuring jasmine and white flowers bouquet, while violet adds a sensual softness. Base Notes: The base of the fragrance is laced with a seductive edge that grows richer...mirroring the BOSS woman's sensuality. In the dry down, vibrant crystal moss echoes the dazzling character of the top while warm woods and creamy sandalwood bring a soft and gentle quality. 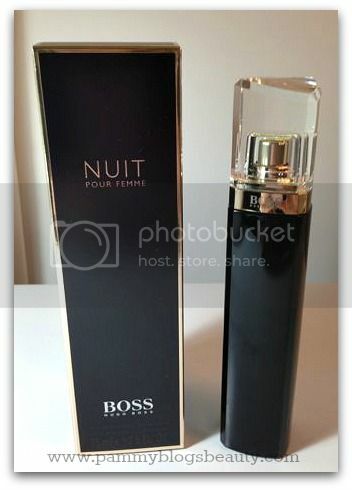 BOSS Nuit Pour Femme Eau de Parfum is available at HUGO BOSS stores and at the HUGO BOSS site. I really do adore this scent! It is classic and elegant without being at all heavy or strong. I find it to be extremely easy to wear, especially in the warm weather. I like how it balances a fresh feel while also carrying strong sophistication. @Chantel-Indeed, the packaging is very chic!